Logan Square Preservation is raising funds to beautify and support a historic church in our neighborhood. 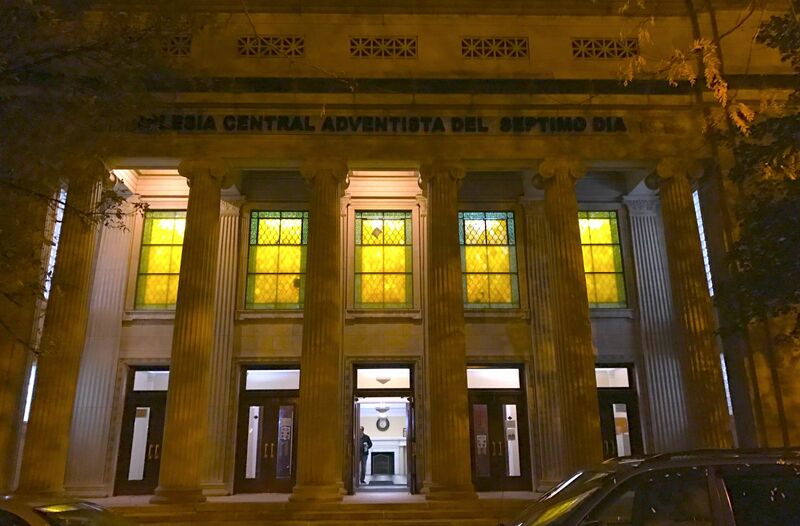 Designed by landmark architect Leon Stanhope and built in 1916 as the home of the Eleventh Church of Christ Scientist, the building at 2840 W. Logan Boulevard today houses the congregation of the Central Hispanic Seventh Day Adventist Church. The church has worked with Logan Square Preservation to remediate many items on Logan and Mozart including tagging of its historic facade. In the spring of 2019, LSP will be recovering the time capsule dating from the construction of the original church. 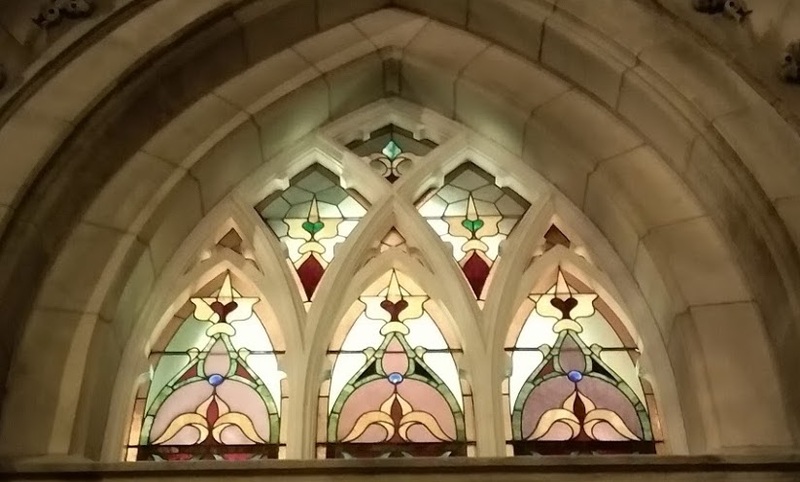 Today, the fish-scale stained glass windows which are an integral part of the design are in need of restoration. Some are being held together by duct tape. 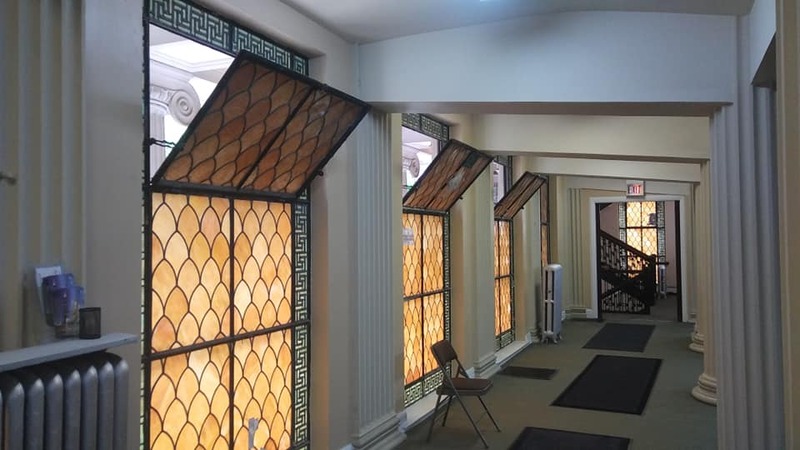 Logan Square Preservation is working with them to raise the $12,000 necessary to completely restore and backlight the windows so they will be visible on Logan Boulevard at night. Please donate to this effort to beautify and support a historic church in our neighborhood. The full amount of all donations, after transaction costs, will go support restoring the windows. Since Logan Square Preservation is a 501(c)(3) non-profit, your donation may be tax deductible. Logan Square Preservation in 2016 raised $5,000 from its members to restore one of the stained glass windows at the Norwegian Lutheran Memorial Church. The Minnekirkin has been the only church to opt-in to the Logan Boulevard Historic District, which protects landmark buildings on the boulevard from demolition. All of the windows were in need of significant restoration. The windows facing the square were obscured behind discolored plastic installed to protect from damage. The restored windows were unveiled in May 2016 and continue to be seen by thousands of people on Logan Square. Since then, the campaign to restore the remaining windows facing Logan Square has raised over $19,000 towards its goal.